Simple, easy to use, system designed to remove water and particulate from fuels and inject additives automatically. 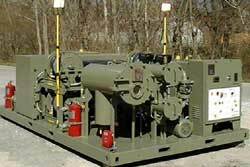 A self-contained unit available consisting of a diesel generator, filter water separator system, on-board storage tank, and an additive injection system. Ideal for processing of fuel in storage tanks and on pre-positioned reserves to maintain fuel quality. Single selector switch with automatic valves. Automated additive injection system that automatically adjusts the injection system to match the processing flow rate. Baron USA, Inc., 350 Baron Circle, P.O. Box 2997, Cookeville, TN 38502. Tel: 931-528-8478; Fax: 931-526-2219.